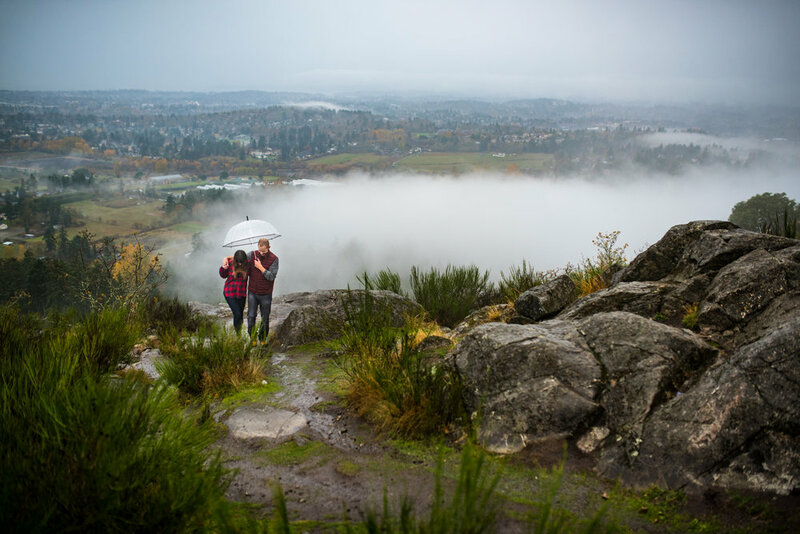 With Melanie and Matt's December wedding fast approaching, we were so happy to hear they had a bit of time to take for themselves to visit friends in Victoria! What a perfect opportunity for us to do some engagement photos with them, and meet their sweet puppy, Nova. Having photographed at Mount Doug in the summer, we thought it would a great place to go with Melanie and Matt. We daydreamed about sunkissed autumn leaves trees at the base of the mountain, and miles and miles of stunning views at the top, that they could experience as out-of-towners. Well, everything works in theory! Ha ha ha! The fog and mist rolled in creating a very dramatic atmosphere around the whole mountain, which was pretty amazing to take in. We were pretty excited for the images it would create. The rain followed shortly after; starting up the second we took the lens caps off our cameras. 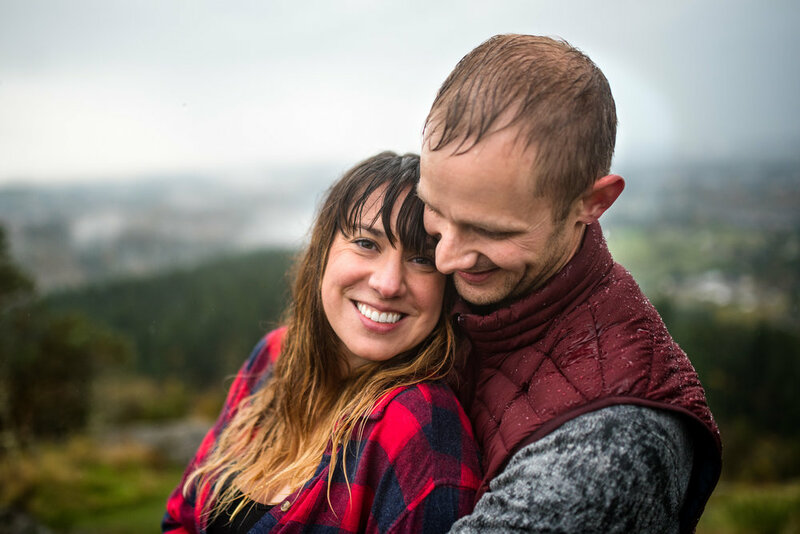 Being outdoor wedding photographers on Vancouver Island's wet coast, we've gotten comfortable working in all types of weather, but we were so glad to see how easily and enthusiastically Matt and Melanie embraced the rain and fog! They were all laughs and giggles as their puppy dashed through puddles, and as their clothes became drenched in rain drops. Even with the dense fog at the top of the mountain, we were still able to take in some spectacular views as tree tops and hills jutted out here and there through the mist. It created an isolated feeling, blanket-like atmosphere: perfect for enjoying some cuddles under their umbrella together! Thanks Melanie and Matt for dancing and skipping in the rain with us, and bringing silly sweet Nova along for us to meet. We're excited for the wedding! Check out more of our blogs here!